Breaking: While BJD keeps fighting contradictions within the party, now it’s time for BJP to get a piece of mind from its senior leader Bijoy Mohapatra. Bijoy alleged that senior leaders in the party are being ignored. The political picture in Odisha will be clear after Bijepur polls, he said. 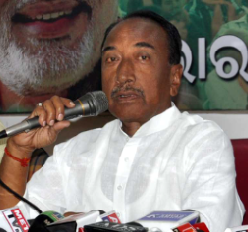 On Dama Rout’s statement related to BJD-Congress alliance, Bijoy Mohapatra termed it “impossible”, but asked BJD and Congress to make their stand clear. Bijoy also claimed that Union Ministers, who are making political comments, are unaware of the ground reality in Odisha.